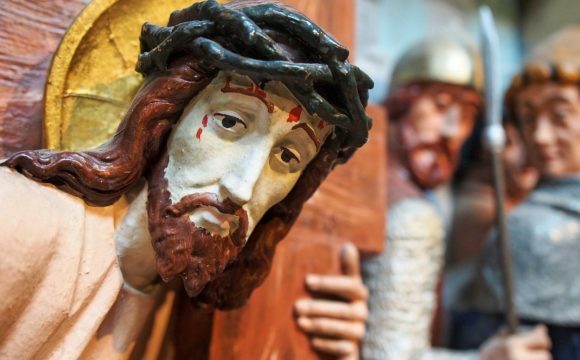 Ten years ago, Archbishop Salvatore Cordileone offered a private Mass for dear friends of his who had just lost their little daughter at a very young age. 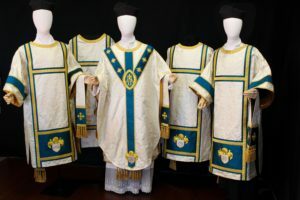 With only a handful of faithful, a small schola choir and antique vestments in the Extraordinary Form, the intimate and reverent Mass was a consoling gift to the little girl’s family. 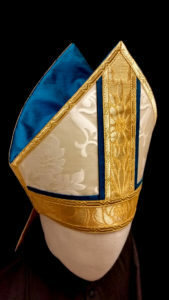 Her godparents, Kirk and Grace Dulaney, were so moved that they asked if they could gift the Archbishop with a small set of vestments similar to the exquisite vestments worn at little Marie’s Mass. 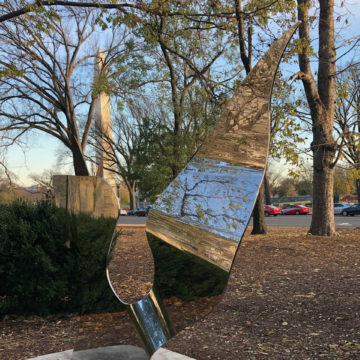 They couldn’t have imagined how that small gift would become part of a historic project. 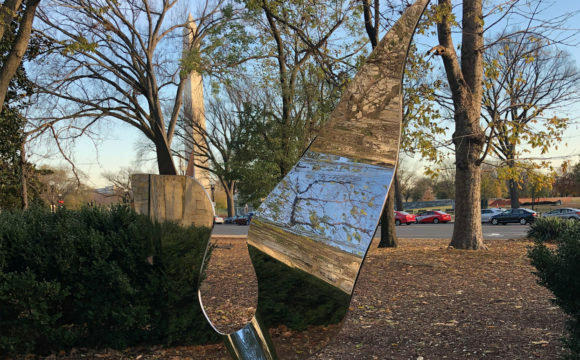 But the vestment gift simmered as a backburner idea for years waiting for the right inspiration – until an urgent phone call last April suddenly put the project on a very fast track. This year, the Solemnity of the Immaculate Conception would fall on the same day as the 25th Anniversary of San Francisco’s Guadalupana Pilgrimage, an annual 12-mile march through the streets of San Francisco ending at St. Mary’s Cathedral, 8 hours later, with a Mass to honor Our Lady of Guadalupe. 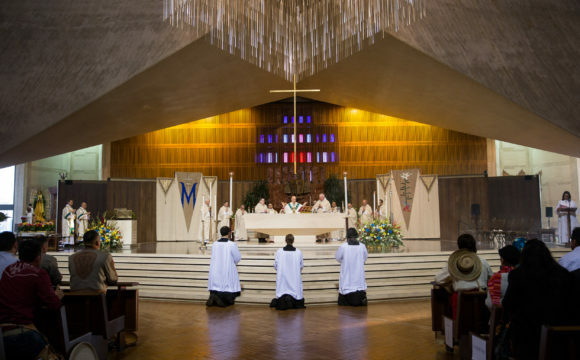 For Archbishop Cordileone, this was an unprecedented opportunity to create something truly sacred and historic – a Mass that would honor both the Old World and New World traditions of the Church – a simultaneous tribute to Our Lady of the Immaculate Conception and Our Lady of Guadalupe! 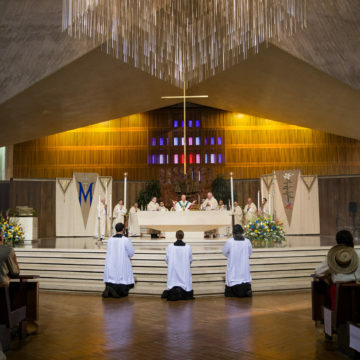 The “Mass of the Americas” was set into motion. We were charged with creating priestly vestments that would represent a harmonious union among Spanish, Latin, English and Aztec cultures. As a result, Our Lady of Guadalupe is gently overlaid with selected titles from the Litany of Loreto as well as some biblical readings from the Mass in the vestments’ design. When the Archbishop’s sudden phone call set the vestments in motion, he urged, “Let’s get that vestment going! I know what I want!” The design decisions were made via a single FaceTime with the Archbishop while the team sketched ideas and held fabrics and trims between the tiny 4” iPhone screens. “He has exquisite taste and a clear idea of what he wants – at the same time, the collaboration was very open and exciting to watch as the ideas flew!” said Dulaney. In keeping with the rich cultural heritage of the Mass, an ivory silk damask prominently featuring pomegranates was selected. A traditional sign of royalty and kingship, the pomegranate is also a sign of the priesthood. The book of Exodus specifically prescribes that pomegranates be used in the design of the Jewish high priest’s vestments. They are also a sign of abundance, fertility (the pregnant Virgin Mary) and the fruitfulness of Holy Mother Church. Thus, their meanings beautifully join Our Lord and Blessed Mother together in her maternity and ancestry. The blue-green color of the luminous teal blue orphreys is the same shade as Our Lady of Guadalupe’s mantle. In contrast with the fine ivory silk of the pomegranates, a hand-loomed silk dupioni was selected (one of the humblest of silks) to remind us of the roughness and simple weave of Juan Diego’s tilma and that she is the mother of us all. The subtle geometric shapes within the gold galloon trimmings recall Aztec pyramid steps. The bright gold silk lining is symbolic of the rays of light behind Our Lady’s image on the tilma. “…a woman clothed with the sun, with the moon under her feet, and upon her head a crown of twelve stars” (Rev. 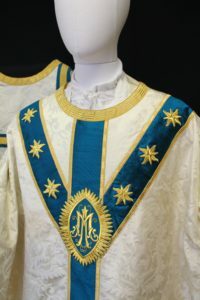 12:1) A monogram of Our Lady with the sun’s rays are surrounded by her 12 stars on the chasuble. The stars are eight-pointed, as on the miraculous image of Our Lady’s mantle. After the rose, the lily is the flower most associated with Our Lady. The pure white lily is the symbol of purity and innocence, peering straight to heaven – the Immaculate Conception. 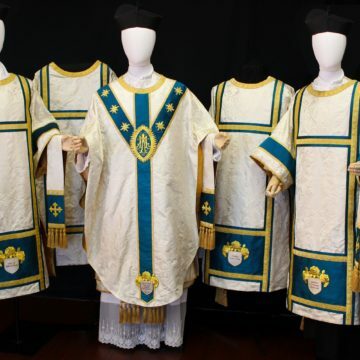 In this set it is seen in the fleur d’ lys crosses used on the stoles and maniples, chalice veil and burse. 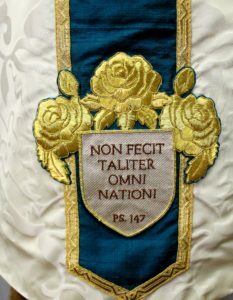 The mitre’s corona also incorporates the daisy, a symbol of the Christ child, along with roses around its’ base. 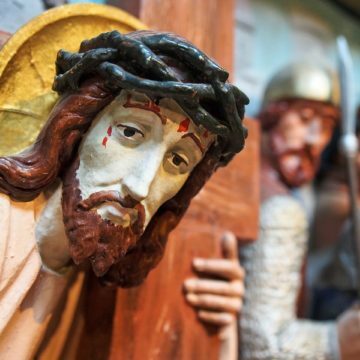 Thus, out of a collection of seemingly unrelated events, Our Lady weaves a miraculous tapestry among the faithful, inspiring priests, benefactors and artists in every age to create new sacred works of music and art built on the pillars of truth, goodness and beauty. Let us call upon Mary to help us rebuild this patrimony so that we can be a part of the restoration of the sacred in our time. 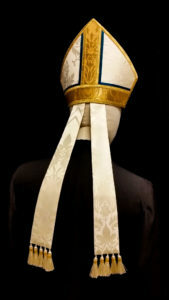 About Emily Uhl and Altarworthy Vestments.